WinPalace Casino is no longer available . Click here for alternative casinos . Ever wanted to feel like the ruler of your own palace? Take a day off Sire! Explore your new castle! You now have the money, means, and power to take part in whatever activities you may choose for yourself. Ahh, now that’s the life isn’t it? Sounds like a dream, but it’s a dream that still lingers in my mind after my first experience at Win Palace casino otherwise written as the ‘Winpalace Casino’. After an in depth investigation of winpalace.com and its royal facilities, I can happily recommend the experience for all of you! Despite minor shortcomings on the Win Palace Casino website, its software and gaming experience is state of the art, worthy of the most experienced online gamer. Looking for the Win Palace Casino Game Buffet? The main course of this Win Palace casino review is of course the casino’s free downloadable software. Like the buffet at Excalibur hotel and casino in Vegas, there’s lots of high quality meat to choose from and it all happens with a few clicks of a button. Software download is free, quick and the website can be explored at the same time, building excitement for your first game of Craps or first spin at the slots. I went and became a millionaire at a real casino before the software installed, but the wait for ‘Winpalace’ is well worth it. For this Win Palace Casino review, I have to say that the gaming experience is not one to dismiss. Good graphics mixed with smooth and quick functions and reactions from the computer create the fast paced atmosphere enjoyed by so many. First time downloads of individual games (seemingly slots in particular) are slow but entering them a second time is instant enjoyment. In addition to all other benefits at ‘Winpalace’ casino, customer service is top notch and available in every form of useful communication. Not the entire Win Palace Casino experience is geared toward veterans however. The software includes the traditional “play for fun” option which gives you a $1000 bonus and freedom to try out all the games for yourself for free. The slots are self-explanatory, fun to learn as you play, and visually enjoyable, but other games have small descriptions of the game itself so that even a first-timer can get a basic feel of how the game works. Gaming options include table games, video poker, slots, and all the common casino specialty games including Craps and Roulette. Though there are a few minor strings attached, the welcome bonus provided at winpalace.com is substantial. At the time of this Win Palace Casino review, new users can receive a 200% bonus up to $1,000 on their first two deposits instead of just one, offering unique help at ‘Winpalace’ Casino. Though it is an international brand, Win Palace Casino does its fair share by accepting American customers and offering the common payment methods of Visa and Mastercard: a huge and convenient plus in my book. In addition to all other benefits at ‘Winpalace’ casino, customer service is top notch and available in every form of useful communication. Even snail mail is included though it can hardly be labeled as useful. Phone lines are open 24/7, a fax can be sent for American customers, and the most convenient instant chat can be accessed on the site and with the software for expert care. 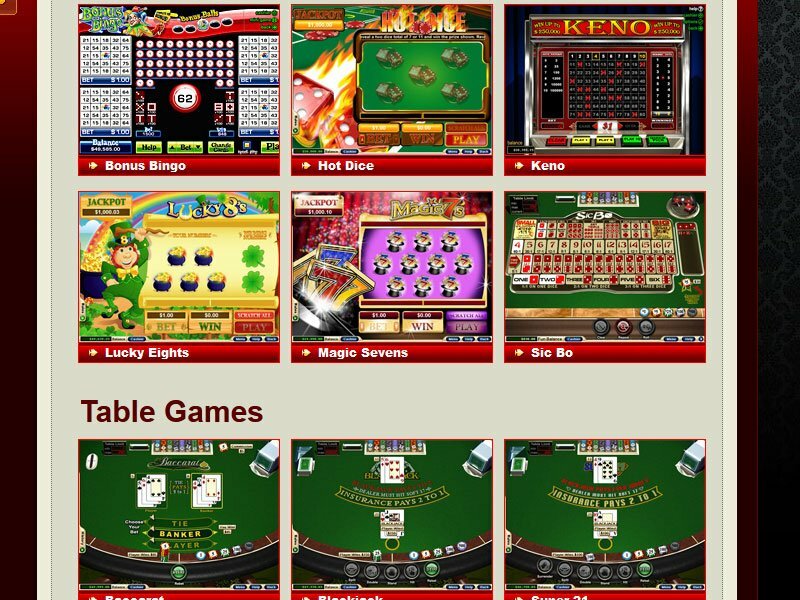 Since my own beginnings in online casinos I’ve always wanted to see websites that would go the extra distance to provide basic assistance to first time gamers in addition to an exceptional gaming experience. After all, the website is already there. How hard can it be to add a page with short video tutorials? Unfortunately, the Winpalace website was another let down in this area, like a pesky, dusty corner that no one will take the time to clean. Obviously this is no major obstacle to enjoying the fruits of this palace’s gardens since thousands of sites can be found abound with tutorials and strategy explanations… but wouldn’t it be more convenient to have the casino and explanations all in one place? Instead it’s like receiving a game of Risk with no rule book, though Risk can be quite fun with no rules. Despite this pet peeve of mine, and the somewhat annoying pop-up that appears on every page asking if you want to download the free software, I have few complaints. 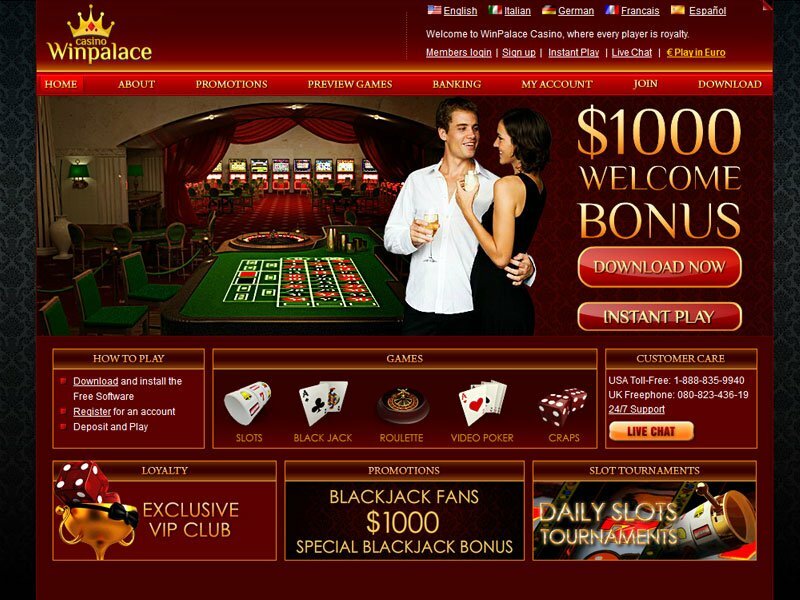 As someone with knowledge of how websites work, Win Palace Casino is built well with an inviting and compact design. It is not overcrowded with pages and everything you need on an online casino is available in an organized and efficient presentation. Do they have any bonuses for blackjack players? Winpalace offers a special blackjack bonus exclusively for their blackjack games. New players receive a 100% match bonus up to $500 on their blackjack games, redeemable 10 times.